This was one of those weekends where Candian stereotypes held up – it was cold, it was snowy. My car termperature this morning was reading -20C. Very cold indeed. Needless today, besides shovelling my sidewalk, I did very little this weekend. Books were read, Netflix was binged (I’ve watched too much Schitt’s Creek), and knitting happened. A lot of knitting. Selfishly, I’m happily working on two cowls: Lace Eyelet Cowl by Stefanie Canich, and I started Anguli Cowl by Hilary Smith Callis. Unsurprisingly, these are two cowls that look like shawls when worn. I’m also fixing a pair of socks I initially made for my co-worker’s daughter. I THOUGHT I made it to the measurements she gave, but either I messed up (which could happen) or her daughter’s feet grew (which does happen), so I’ve been trying to fix the mistakes. One sock down, one to go. The pattern is the lovely Hermione sock, but because the yarn is self striping, I’ve made it with an afterthought heel, a technique I hate. I was bemoaning about this a few months ago at a knitting group when one of the women said something that has changed my outlook. To make an afterthought heel, you knit the leg to the length you want, then knit half of the stitches with waste yarn , then continue knitting the same stitches with the working yarn. The idea is, you remove the waste yarn and have the right amount of live stitches with which you can work the heel, leaving the self striping yarn’s pattern uninterrupted. Simple enough concept, but removing that waste yarn and putting the stitches on needles is a process that usually leaves me using lots of creative curse words. Then Vickie said: you should knit more than one row with the waste yarn. Lightbulb went off. Really, the waste yarn is just keeping the heel stitches live for later. It doesn’t matter how many rows with the waste yarn you knit. By knitting MORE THAN ONE ROW, you are making it easier to pick up those stitches and remove the yarn. There’s very little room when only one row is knit, but the angles are easier to work with when there’s, say, three rows of waste yarn used. Sorry it’s a little blurry – but as you can (maybe) see, there’s three rows of white waste yarn used which are holding the heel stitches for an afterthought heel. I tried her advice with the Hermione sock, take two. It was so much easier than any other time I’ve tried this technique. Seriously. If you haven’t been doing this for afterthought heels, try it. Mind blown. 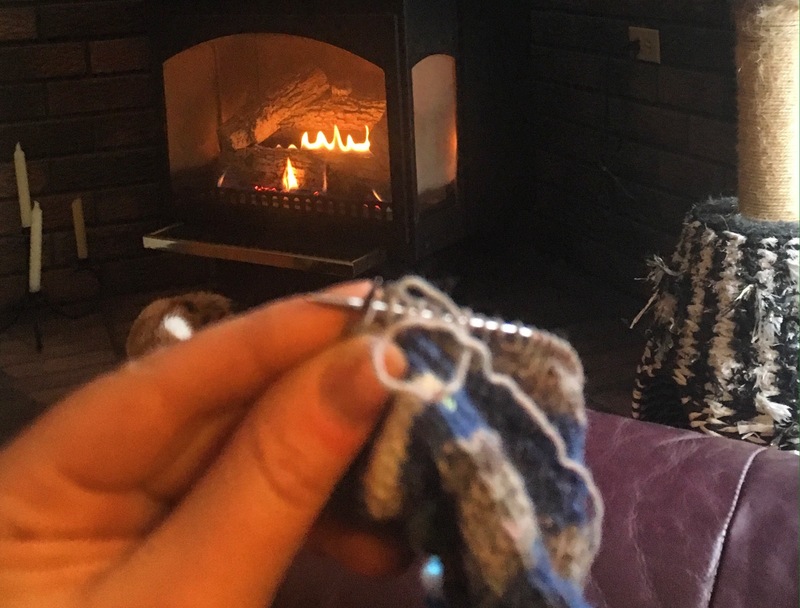 Happy knitting, and if anyone is living through these temperatures or anything close, stay warm!